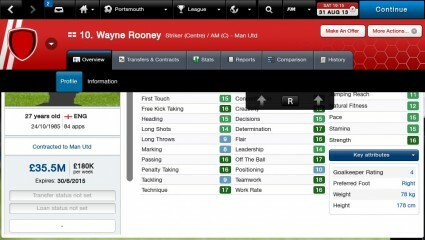 Football Manager Classic 2014 Review - This Is My Joystick! I haven’t played any football management games since Championship Manager 97/98. Yes, it’s been that long, and yes I am old enough that I was playing that whilst at university (exactly why rule one above came into effect!). Sports Interactive have always had a magical ability to marry a gobsmacking level of complexity and depth with an equally dumbfounding level of addictiveness, and in this Vita game that trend continues. This is meant to be a handheld on-the-go version of the Classic Mode from the PC game, so you can get a lot of the finer management done for you by other members of staff leaving you to concentrate on building and managing your team through the season. For my time with FMC 2014, I opted to play as Bristol Rovers, partly because I’m an idiot, and partly because I support them, for my sins. It’s fair to say I didn’t make life easy for myself here. The Gas were expected to be relegated (a fact sadly reflected in real life with a heart-breaking final day), and had little money with which to improve the squad. Unfortunately for me, my management skills are apparently no improvement on John Ward’s as the season went the same way. However, even in such dire circumstances there’s still so much to appreciate. Tinkering too much, too often with your starting 11, formation and tactics has a noticeable impact on the side, while trying to develop one style of play and a fairly consistent starting 11 genuinely improves your team’s performance. Even when losing an awful lot of matches, that desire to keep on playing another match remains, in my case just to see if I could get a run of decent results together, and on the rare occasion I actually did, to see if I could build on it. 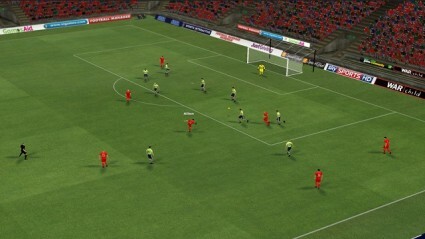 During matches, highlights are shown in a new 3D engine. This is a little ropey in action but is generally a fantastic addition, causing feelings of equal parts excitement and trepidation every time a highlight kicks in as you’re never sure how it will play out. There seems a great depth of different scenarios that play out, I don’t recall seeing anything remotely the same repeated. It’s worth noting that if you go in expecting that any time you get a highlight and your team has the ball, a goal is on the way for you as I did, you’ll seen realise that’s far from the case. The commentary doesn’t always match quite up to what’s happening on screen but is usually pretty accurate. On a couple of occasions I did see good efforts on goal noted as terrible misses, and thought to myself I would’ve been quite happy getting that close to goal if I was playing… Given the general scope on offer though, you’re always likely to get the odd minor slip so it can easily be forgiven. Much in the same way, there is the odd strange comment in reports for matches. In particular, I had a horrendous start to the season, failing to win any of my first 8 matches, yet towards the end of that run kept getting told how after a promising start to the season I’d gone on a bad run. It doesn’t impact on any enjoyment really, but I found it drew me out of the experience slightly. It’s with screens like this that the touch controls start to get a bit much. If there is a genuine negative regarding FMC 2014, it’s the touch controls. There’s so much crammed into the screen that a lot of the buttons are incredibly small, making it extremely difficult to touch the correct area. My fingers are far from huge but I still had cause to get fairly frustrated with how this was set up. In particular, when trying to bring on a substitute there are a couple of thin buttons allowing you to confirm your substitution. One is at the top of the screen and seems very unresponsive, which is bad enough in itself but if you happen to catch it a couple of times, say because you’re losing your patience a little and start hammering at it (I, of course, would never lose my temper with any game, honestly…), you’ll find that once the first tap has registered the confirmation, the second tap will in fact cancel it as that area is instantly replaced with the cancel change button. Another annoyance was the act of actually selecting a substitute. If this required scrolling through a list of players, I found more often than not that my swiping to scroll instead resulted in the name of the first player my finger hit being selected rather than the list actually scrolling. 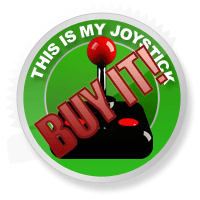 Fortunately the analogue stick can be used to scroll as well so I ended up relying on that. I’m really not sure why so much reliance has been place on the touch screen here. In theory, it’s fine for a lot of the things you need to do, but for any future iterations this aspect definitely needs some work. Irrespective of some minor flaws, in particular with the touch controls, this is Football Manager in your pocket. If you love the series, and fancy taking it on the go with you then it’s easy to recommend, and is perfect really to pick up for a couple of matches on a journey. Just try not to get so caught up in it that you forget where you’re going! I really enjoyed this too despite the obvious control issues. I fared a little better than you too, managed to do what Roger’s couldn’t and won the league and FA Cup. Managed to sign some top quality on the oddest financed deals too.